As spring arrives, I am reminded of a creative program that I used several years ago. We made paper sculptures of irises and chicks. This is an adaptation of Origami – the art of paper folding, often associated with Japanese culture. Origami purists transform a flat sheet of square paper into a finished sculpture without cuts, glue or marking on the paper. These two activities use all of the above and are therefore not true origami. The irises and chicks activities were created by Tammy Yee and it is with her permission that we have adapted them for people with dementia and make them available here. 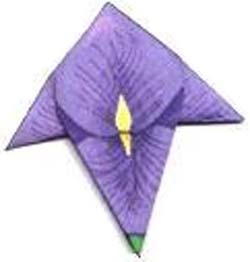 There are several basic folds that are used to make these finished shapes which you can learn more about at How to Make Origami. Making the finished sculpture from a flat piece of paper may seem overwhelming to some and so we follow the Montessori principle of “Sequence” to break the activity down into distinct tasks. Some tasks may be a single step (a simple fold, for example) while other tasks may involve several steps (a crease and a fold, for example) and be appropriate for participants able to handle more challenging instructions. The activity can be done by individuals (perhaps with help for tasks that are too challenging) and is also an ideal small group program. The key to making this a successful group program is to give each person a task in the assembly line. If you don’t have enough participants for each task, rotate the tasks among the participants as appropriate for their abilities. Before starting the activity, prepare one finished example showing the progress after each task has been completed, as well one showing the finished sculpture. Some projects require preparation before the origami aspect begins. I find it best to do those steps in advance of starting the activity. 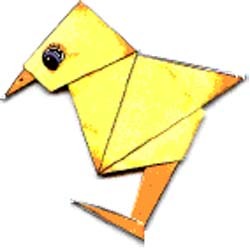 In the case of the Easter Chick for example, the page has to be printed and cut before beginning as described in the instructions. After you have prepared the materials, start by inviting the person to join you at the table and help make paper sculptures to be used to decorate the area. If you are doing it as a group activity, invite the first participant. Place the prepared paper on the table within reach of the person and provide a designated location to set the folded sheets (a basket, place mat, etc). Show them the example of the task that they will be doing and demonstrate the action that is required to complete the task. Once they are completing the task independently, have the person move on to the next task. In a group program, invite the next participant to join you and have the person sit at the table with the first participant in a position that is within reach of the folded sheets. As before, show the person the prepared example of their task and demonstrate the task using one of the folded sheets prepared in the previous step. Place this folded paper so that it will be available for the next participant and so on. The first fold is typically the easiest task in the project. If there is a person who would enjoy participating but may be challenged to complete an entire task, in advance of preparing for the activity offer them a sample and have them try the fold. If they struggle with it, offer them a pre-folded piece that has been opened out and ask them to fold it. If they are successful, make the first fold in advance of the activity and use those sheets with the person.